Warwick Kerr brought Apis mellifera scutellata from Africa to South America in 1957 to help revive the failing Brazilian beekeeping industry, which was using various European subspecies of Apis mellifera L., unsuitable for the South American environment. The queens and workers of several colonies were accidentally released, and these aggressive bees hybridized with local colonies. A. m. scutellata has been gradually spreading ever since, causing economic, social, and ecological problems, due to the more agressive behaviour shown by these hybrid bees. Compared to Apis mellifera, the most distinguishing trait of A. m. scutellata is their more defensive behavior around their nests and their propensity to sting in large numbers. A. m. scutellata are also slightly smaller, but this can only be ascertained with a microscope. A. mellifera can withstand colder temperatures than A. m. scutellata. While European bees generally only reproduce two or three times a year, Africanized bees can reproduce up to 17 times annually (Lantigua, 2008). The advent of new morphometric techniques which analyse worker forewings is starting to allow samples of Africanised (A. m. scutellata) and European (A. mellifera) bees to be distinguished quickly and precisely, while being relatively inexpensive (Francoy et al. 2008). Unlike Apis mellifera , A. m. scutellata does not hoard honey over the winter. Instead they depend on colony mobility (absconding and swarming) to find new sources of food, water, or space if one or all run out. The queen mates with male drones to create fertilized eggs, which become female worker bees. These fertilized eggs can become queens if they are fed as larvae (by hive worker bees) large quantities of an extremely nutritious creamy white liquid -royal jelly, a mix of hypopharyngeal and mandibular gland secretions. The queen also produces unfertilized eggs, which become reproductive male drones (Masterson, 2007). One queen can produce 1500 eggs a day. Swarming is more important than queen egg laying in population expansion. The actual mating takes place during swarming events, which have seasonal synchrony between colonies, thus increasing potential mates and reducing inbreeding. Queens have the ability to mate with multiple drones, and store the sperm internally, allowing them to fertilize eggs for their entire lifetime. Colonies reproduce by frequent swarming, and one colony can result in 17 colonies after a year when both reproduction and mortality are taken into account (Masterson, 2007). Apis mellifera scutellata provides pollination services in the tropics. Some farmers believe they are beneficial to their crops because they provide superior pollination to A. mellifera . The value of cultivated crops which are pollinated by honey bees in the US is estimated to be $10 billion annually apiary/honey (Arkansas State Plant Board n. d.).The health of bee colonies can be used as an indicator of “flowering plant productivity, ecosystem stability, and relative ecological health” (Ojar, 2002). Research has shown that African bees deter African elephants from damaging vegetation and trees near where hives are located. African bees have the potential to be used to protect both selected trees and selected area from elephant damage (Vollrath et al. 2002). Further research has shown that hearing played-back recorded sounds of disturbed wild African bees (Apis mellifera scutellata) caused a large majority of elephants to walk or run away from the source of the noise (King et al. 2007). Apis mellifera scutellata is less selective in its habitat preferences than A. mellifera . A. m. scutellata can be found in tree hollows, rotted logs, and in many manmade structures, such as wood and rock piles. They are limited to tropical and subtropical habitats because they are accustomed to a wet and a dry season, as opposed to the hot and cold seasons associated with temperate regions. The queen mates with a drone to create a fertilised egg, which becomes a female worker bee. The queen also produces unfertilised eggs, which become male drones. Eggs become queens if they are fed (when they are larvae) large quantities of an extremely nutritious creamy white liquid -royal jelly, a mix of hypopharyngeal and mandibular gland secretions. One queen can produce 1500 eggs a day. Swarming is more important than queen egg laying. Colonies reproduce by frequent swarming, and one colony can result in 17 colonies after a year when both reproduction and mortality are taken into account. Bees feed on nectar and pollen. The nectar is converted into honey and is the bee's principle source of carbohydrates, while pollen is the source of protein. Africanized bees often depend on their increased rate of colony mobility (swarming) as a response to seasonal fluctuations in food supply. European honeybees are better at hoarding vast amounts of honey and surviving long, cold winters (Kurzmann, undated). Introduced to help the honey industry in Brazil as they were better adapted to South America. Principal source: Ojar, C., 2001. Introduced Species Summary Project on Africanized Honeybee. Project Editor: James A. Danoff-Burg, Columbia University. Review: Mark L. Winston, Professor and Fellow, Morris J. Wosk Centre for Dialogue, Canada. 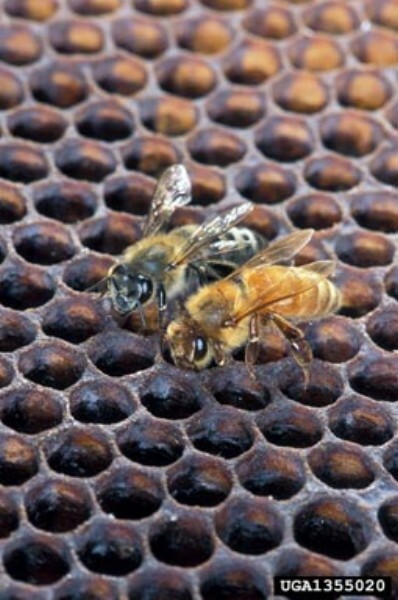 Recommended citation: Global Invasive Species Database (2019) Species profile: Apis mellifera scutellata. Downloaded from http://www.iucngisd.org/gisd/species.php?sc=325 on 21-04-2019. Apis mellifera scutellata, the Africanised Honey Bee (AHB), are aggressive bees that defend their nest from intruders up to 50 feet away by stinging in the hundreds and chasing intruders up to a mile. They have caused deaths of pets, livestock, and even people, giving them their \"killer bee\" nickname. People and other animals are usually killed only if they are unable to get away. Victims of A. m. scutellata attacks commonly receive ten times more stings than similar attacks from European bees, and bees respond to disturbances up to ten times faster than European bees (Ojar, 2002). It should be stressed here that their main impact is not by taking over colonies through killing queens, but rather through mating, resulting in inbred colonies. These inbred colonies have increased aggression, are less tolerant to winter temperatures, and abandon nests more frequently (Ojar, 2002). Hives of AHB are abandoned at a much higher rate than European Bees – abandonment rates of up to 10% have been recorded. AHB also invest less energy into the storing of honey then European bees, with more energy invested in rearing brood (GISP profile (word doc)). These are attributes which are not desirable within cultivated honeybee hives (Masterson, 2007). Beekeepers' business is threatened by the high labor costs of workers willing to harvest A. m. scutellata honey and frequently re-queen nests. It is also a concern that some ecosystems could be at risk because A. m. scutellata outcompetes native pollinators when they invade their territory. A. m. scutellata 's largest impacts are economic and ecological. They affect the beekeeping industry by competing with A. mellifera, causing them to produce less honey and taking over the A. mellifera nest by killing its queen and replacing it with their own. The AHB is also a less effective pollinator than the European Honey Bee. Increases in numbers of AHB could put the honey industry (worth $140 million dollars annually in the US) at risk, as well as cause a general reduction in pollination of field crops and orchards (estimates of value range from $10 billion to over $14 billion dollars annually in the US) (Ojar, 2002; Masterson, 2007). The ecological dominance of the AHB, coupled with their rapid rate of spread (200 miles per year) means the AHB has the potential to make many species of native bees extinct (Ojar, 2002). Public prejudices against bees and the beekeeping industry would be an unfortunate result of fear caused by media over-dramatisating an attack by the AHB. This may lead to calls to ban bee keeping in urban areas, which will cause empty suitable habitats for bees. The AHB will fill these voids, and establish to a greater extent, causing even more problems. To prevent Apis mellifera scutellata from interbreeding with commercially reared A. mellifera, the relevent area is flooded with a very high number of commercially reared A. mellifera drones, limiting the possibility of mating with A. m. scutellata . Frequent re-queening is also done to ensure A. mellifera queens are maintained (Ojar, 2002). Another strategy is to inject A. mellifera sperm into an A. m. scutellata queen, resulting in the production of less aggressive bees. Many countries try to destroy the bees with chemicals and traps, however, this strategy however is not very effective. Public education programs in areas where AHB is becoming a problem will allow the public to know how to report the location of a swarm to the relevant authorities for removal (Ojar, 2002). Bees can be easily immobilised and killed by wetting agents (surfactants), including dishwashing detergent, as well as nonfoaming fire control chemicals and foams (USDA-ARS, 2008). Bees are generally immediately immobilised, and killed within one minute. Informations on Apis mellifera scutellata has been recorded for the following locations. Click on the name for additional informations. Arkansas State Plant Board, undated. Arkansas Africanized Bee Action Plan. Moritz, Robin F. A., Vincent Dietemann and Robin Crewe 2008. Determining colony densities in wild honeybee populations (Apis mellifera) with linked microsatellite DNA markers. Journal of Insect Conservation 12: 455�459. Ojar, C., 2001. Introduced Species Summary Project on Africanized Honeybee. Project Editor: James A. Danoff-Burg, Columbia University. Summary: A report on the description, history, distribution, threats, benefits, and a brief description of management options. United States Department of Agriculture - Agricultural Research Service (USDA-ARS). 2008. Africanized Honey Bees. Walker, K. 2006. Africanized honeybee (Apis mellifera scutellata) Pest and Diseases Image Library. Updated on 2/02/2006 1:51:37 PM. California Department of Food and Agriculture, 2000. Pest Detection/Emergency Projects Branch Africanized Honeybee Pest Profile. Summary: A report on the history, description, distribution, and lifecycle. Corn, M. Lynne, Eugene H. Buck, Jean Rawson, and Eric Fischer, 1999. Harmful Non-Native Species: Issues for CongressVI. National Council for Science and the Environment. Summary: A report on many different invasives that includes A. m. scutellata. Gives a brief history, description, distribution, and affects of the honeybee in North America. Ellis, James D. and Amanda Ellis, 2009. African Honey Bee, Africanized Honey Bee, Killer Bee, Apis mellifera scutellata Lepeletier (Insecta: Hymenoptera: Apidae). This document is EENY 429, one of a series of the Entomology and Nematology Department, Florida Cooperative Extension Service, Institute of Food and Agricultural Sciences, University of Florida. Original publication date February 2009. Revised November 2009. Lantigua, J. 2008, December 8. Bee attack that killed 4 dogs raises concerns about vacant properties. Palm Beach Post. Summary: Case study of A. m. scutellata reproduction and lifecycles compared to European honeybees. Also gives a detailed history of A. m. scutellata s arrival into the Americas.